Tidal freshwater wetlands occur in the upper part of estuaries, where fresh water from the river is influenced by tides. Sedimentation is prominent in the tidal freshwater zone; mud flats become elevated and may become fertile agriculture areas after reclamation. Many prominent cities (e.g., Hamburg, Rotterdam, Philadelphia, Washington, DC) were founded in or near tidal freshwater systems, resulting in their loss or degradation. A number of characteristic plant and animal species occur in tidal freshwater wetlands, reflecting their unique biological, chemical, and physical processes. These communities are distributed over different subsystems, such as the river, tidal creeks, reed and bulrush marshes, higher marshes, and various types of tidal swamp forest. Productivity of tidal freshwater wetlands is similar to that of salt marshes but plant and macrofaunal diversity are higher. Sets of case studies illustrate various conditions from Europe and North America. While many tidal freshwater wetlands have disappeared, during the last decades restoration projects have been initiated to conserve this diverse and productive ecosystem. As editors we have reached this time and place via very different routes. One common feature, however, is that somewhere over the years we each became enamored with tidal freshwater wetlands. Our interests eventually resulted in efforts that culminated in a symposium on tidal freshwater wetlands at the 7th INTECOL International Wetlands Conference held in Utrecht, The Netherlands in 2004 (Bobbink et al. 2006, Verhoeven et al. 2006) and ultimately this edited volume. Most field-oriented ecologists are in the ‘business’ because of something that occurred in the past that inexorably linked them to nature. In this case, we each became linked to tidal freshwater wetlands through independent yet compelling experiences. We digress to those moments before describing the logic and goals of this volume. DFW first became interested in tidal freshwater wetlands one autumn day in 1971. Fresh out of graduate school and enmeshed in planning lectures at Rider College, he was asked by one of his students to visit a wetland area on the Delaware River that was under threat from a proposed road construction project. The day for his first visit to the Hamilton Marshes (the northernmost TFW complex on the Delaware River, NJ) was perfect. The sky was blue, the temperatures cool, and the wetland was a maze of vivid colors from the autumn flowering species on the high marsh. Migratory birds were everywhere and flocks of red-winged blackbirds descended on enormous stands of wild rice. Thoughts of how dynamic tidal wetlands were came flashing back, especially memories of Howard Odum running through a tidal marsh in North Carolina, during a field trip in his Oceanography course, exclaiming about the wonders of tidal subsidies, and then the realization that all of the diversity and the obviously high level of primary production that was evident everywhere was occurring in an environment where there was indeed a large tidal amplitude but the salt was missing. From that moment on TFW ecosystems have been DFWs favorite ecosystem. AatB spent many days in a rowing boat in the Biesbosch before November 1970, fascinated by the tides and he got the impression that this system was real nature. After one tide all human footprints had been wiped out, so that at next low tide a pristine mud or regular ribs on the sandbanks remained. The vegetation was wealthy and rich in flowers, the number of special birds high, the morphology of the creeks highly dynamic; nature was the only ruling force. As a master student he performed his research on invertebrates in the Oude Maas area. In the following 25 years the vegetation and environmental science in dunes, heathlands, and fens were his profession, but he realized that the tidal freshwater wetlands were neglected by society. Good old Ies Zonneveld was one of the few persons who maintained to indicate the values of this system in Europe; we were happy to invite him for a presentation at the Utrecht Conference in 2004. This volume follows a way of reasoning we have in common, incorporating the landscape, history and time, abiotic processes, and species’ presence. Despite years in the environmental consulting field as a wetland scientist, AHB had never experienced a tidal freshwater wetland until he went to Louisiana for his doctoral studies. Accustomed to the relatively small (but beautiful) wetlands of New England, he was floored by the vastness of the wetlands of the Mississippi River delta plain, including tidal fresh and oligohaline marshes. His mother, Virginia, instilled in Andy a deep love of plant naturalism, and the floristically rich low-salinity wetlands were the perfect place to botanize. Happily, he found in Maryland and the Chesapeake Bay extensive tidal freshwater wetlands, including both marshes and swamps, where he developed much of his faculty research program. The tidal freshwater swamps were particularly fascinating to him as many of them, with their hollow-hummock micro-topography, had plant communities containing marsh species, forest herbs, ferns, shrubs, and trees. Truly tidal freshwater wetlands are a botanist’s paradise, made even more interesting by their dynamic physical processes and complex ecological interactions. Now back to this volume and the reasons for the effort to develop it. In many coastal estuaries, the tidal freshwater zone occupies a critical position between the sea and the land. Non-tidal rivers discharge directly into the upper end of the tidal freshwater zone and the lower end of the zone is where fresh water and brackish water first mix – the latter often associated with the maximum turbidity zone in estuaries. The upper end of the tidal freshwater zone historically also typically represented the furthest point that ships could transit and many European and American cities developed at the upper end of the tidal freshwater zone. Consequently, many of the ecosystems that occur in the tidal freshwater zone have been heavily impacted by human activities, especially in Europe. Ecologically, systems in the tidal freshwater zone provide a unique opportunity to test hypotheses about the relative importance of several factors (e.g., tides, sedimentation, nutrients, salinity) on ecological processes. Tidal freshwater wetlands receive the benefits of a tidal subsidy without the stresses associated with brackish conditions (Odum et al. 1995). The input of sediments and nutrients from non-tidal rivers provides yet other subsidies, or at times stresses, that influence ecosystems processes. Ecosystems in the tidal freshwater zone also provide important resting and feeding areas for animals that migrate. Historically, however, ecosystems in the tidal freshwater zone received little attention from the scientific community because they did not fit into the general models used by estuarine and riverine ecologists. Because they are fresh water, estuarine ecologists often ignored them, and because they were tidal, riverine ecologists rarely studied them. 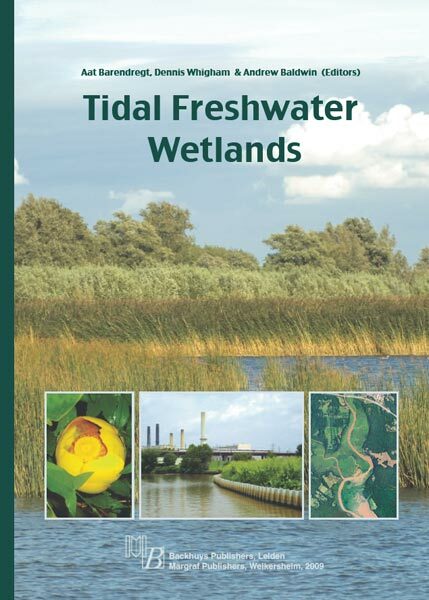 Only in recent decades have scientists ventured into the tidal freshwater zone of estuaries and, as will be shown in several chapters in this volume, tidal freshwater wetlands are not yet recognized as a critical component of many estuaries. Our primary goal in developing this volume is to summarize what is known for the geomorphology, human uses, ecology processes, and flora and fauna of tidal freshwater wetlands. The chapters focus on North America and Europe, where most of the research on tidal freshwater ecosystems has taken place. As indicated earlier, the idea for this volume originated at the 7th INTECOL International Wetland Conference where three of the editors of this volume co-organized a symposium on tidal freshwater wetlands (Barendregt et al. 2006). The idea behind the symposium was the realization that there had never been an attempt to compare and contrast tidal freshwater ecosystems in Europe and North America even though it was clear that there were many similarities between ecosystems in the tidal freshwater zone on both sides of the Atlantic. The Utrecht meeting provided a lively forum for discussions among many scientists who had studied or were actively studying freshwater tidal ecosystems. In the end, the participants at the Utrecht symposium suggested that the organizers invite their colleagues to contribute to a synthesis volume with the goal of comparing tidal freshwater wetlands in North America and Europe. The timing of a synthesis volume seems appropriate as there had never been an attempt to synthesize the literature on tidal freshwater wetlands in Europe and no attempt had been made to synthesize the literature on North American tidal freshwater wetlands since the 1980s, except Mitsch and Gosselink (1993, 2000), even though a considerable volume of literature had been published in the intervening years. This volume is the result of the efforts that originated at the Utrecht conference. 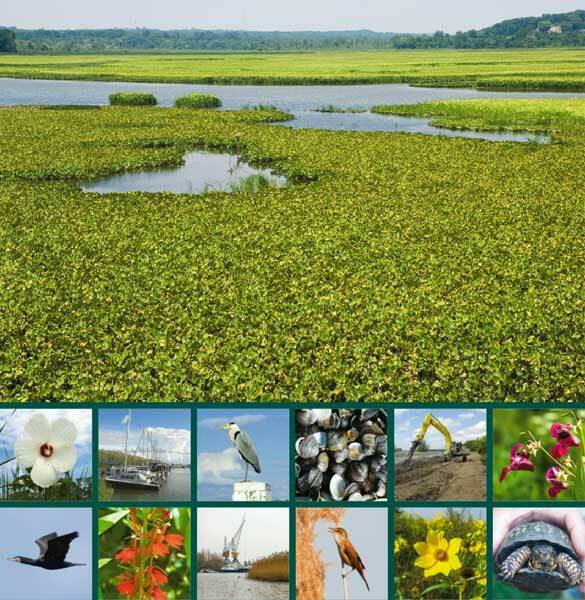 The editors hope that the contents of the volume provide a framework for future efforts to study, conserve, and restore tidal freshwater wetlands. We also hope that it provides an update and synthesis of the literature on tidal freshwater wetlands that will be useful to individuals who want to gain a better understanding of these fascinating wetlands, wetlands that combine features of tidal wetlands and non-tidal wetlands.